I might just have to check it out. I thought that most musicians agreed that you put the crap song last and that was OK, because you would be forgiven by the end of the listening – haha – I don’t know if that is true (I just made it up 😉 ), but a hell of a lot of albums do have a crap last song. Well, Gabe, there are many who are saying that the last song on this album, ‘Beth/Rest’, is crap. I’m two minds: sometimes I like it, sometimes I hate it. Then again, I feel like that with many things. There’s probably a mental disorder around that. OK, you and I usually like the same music, but generally there’s not mutual love. In this case, Bon Iver have pulled out the impossible. I love it more with every listen, and there have been many. It’s amazing. Go buy it people. Bought it online a couple of days ago. Didn’t like ‘For Emma’ (found it blah, couldn’t understand why people raved about it so much!) but they featured this one on JJJ a couple of weeks ago and I liked the two or three tracks that I heard. Definitely think the lusher sound is what’s going to be the difference for me. Waiting by my mailbox in anticipation! Nice to read an album review from you, as always. 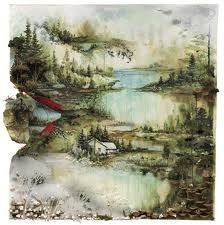 I’m reminded of Bon Iver with it.